Mountain Driftboat's pre-owned driftboat and skiff packages change daily. Please give us a call to get an update on our present pre-owned inventory. All driftboat and skiff packages come with a trailer, oars, anchor, and anchor rope. All pre-owned boats come with Clacka's lifetime guarantee against bottom punctures and leaks. Call to ask about our lay-away program. 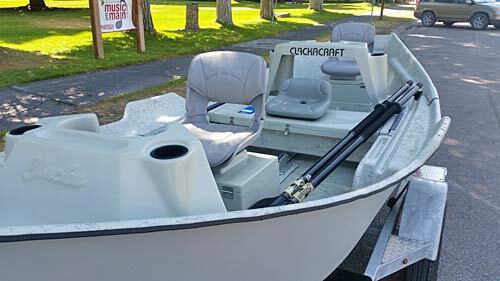 This 2009 18' Clacka Max comes with some nice upgrades: Sawyer Square Top oars, two captain's chairs, motor mount, spare tire and mount, and a custom anchor carrier. $8700. Please email us if you would like more details. You're not going to find a cleaner 2015 16LP anywhere. This one will not last long. It comes on a galvanized trailer, is equipped with new Sawyer oars, a new 30# pyramid cast iron anchor and is priced to sell at $7,895. This EDDY is in excellent condition. All you need to do is add some water and a couple of fishermen. $7895. This 2014 EDDY with a Yeti cooler and swivel seat up front is a great set up. By putting the cooler forward and in the center of the boat it improves the overall balance of the boat. This EDDY, as shown with a new Yeti cooler and new galvanized trailer, is $8,645. Super clean 2010 Clacka 16LP Fly Pod. This one won't last long. It has loads of extras ... Galvy trailer, spare tire and mount, motor mount and anchor next. Call for more details. $7795. 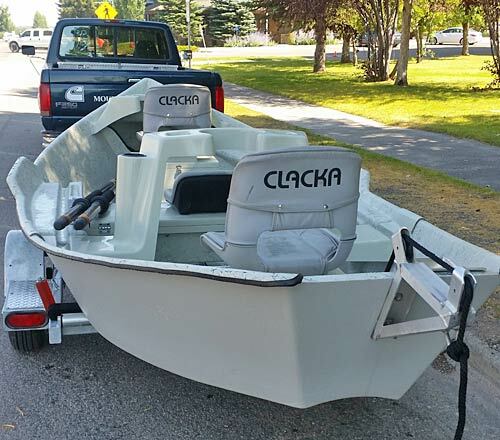 This 2012 Clacka is in excellent condition and ready to go. The olive drab exterior is one of our most popular colors. $7895 for the package. We went thru this 2008 16lp bow to stern and it's ready to fish. $6,995 for the package. 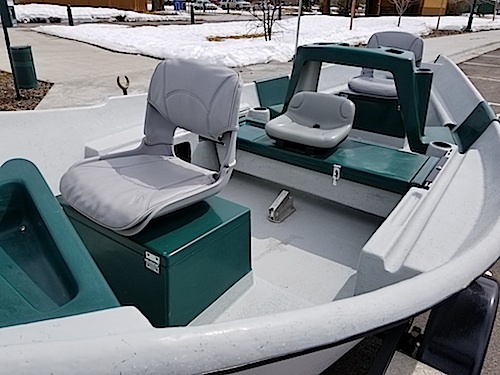 Please give us a call for more info on this boat and for our updated used inventory list.